This is such a lovely fun arrangement Susie and very clever use of props. I find it very difficult to arrange very short stemmed flowers, partly because whenever I go to buy vases I’m attracted to large ones when what I need are small! You have a great collection of large vases. With pansies and other short stemmed flowers it’s hard to have much control over arranging them. They have their own ideas. I don’t use props often but it was fun to play off the rabbits when taking photos. The colors are amazing and I love those cheerful pansies and violas. I renewed a few containers this weekend and it was a grief to do away with a few, just when they are looking so smart, but I still have plenty in the garden beds. 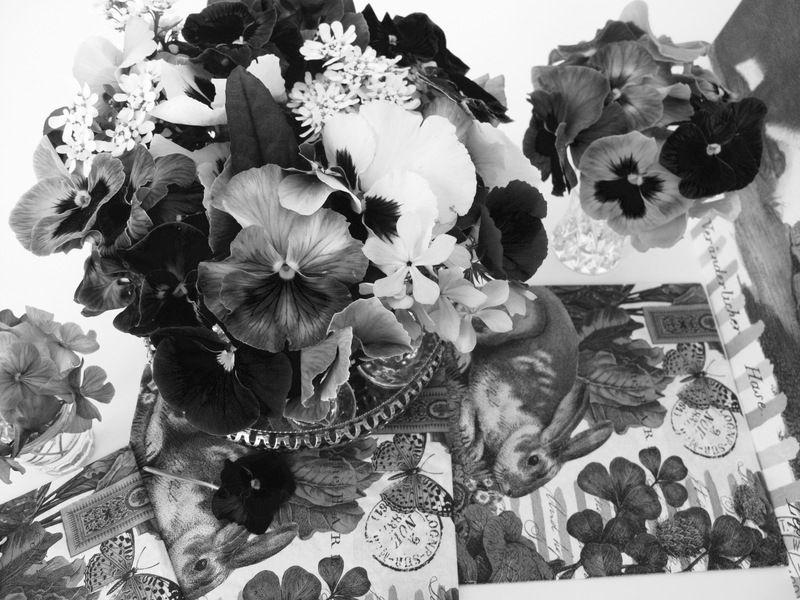 It is hard to take out pansies when they’re looking nice–I always wait too long. Also I bought pansies too late last fall and my normal blues and purples were all picked over, but luckily I found multi-colored collections on sale. Thanks. They are bright and cheerful in pots. Thanks, it was fun to play around. Thanks Judy. Zone 7b. I got the pansies planted too late last fall for them to do well over the winter, but some years they bloom pretty well all winter. 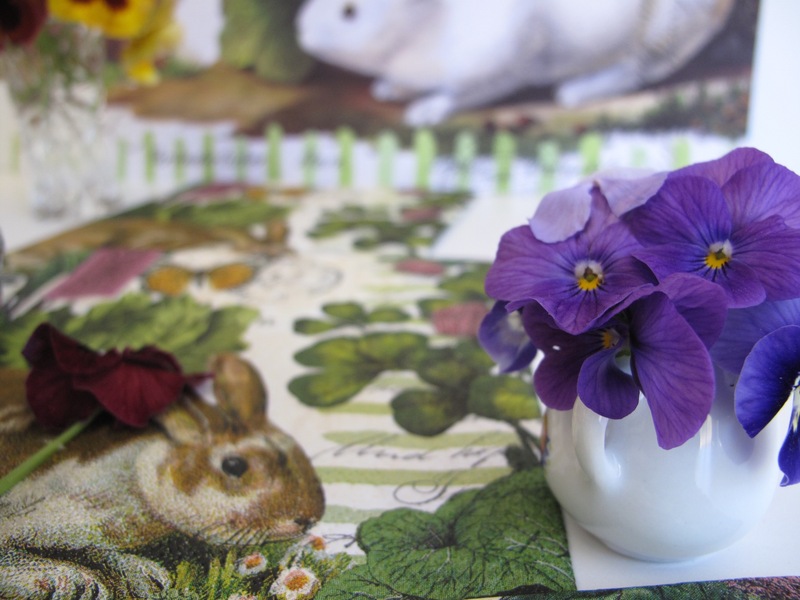 The rabbit placemats were fun to photograph with the flowers. I even spilled water but it dried without damage. Those cordial glasses have come in handy this year to hold flowers. I’m searching now for more little containers. Wonderful colors, Susie. We are debating about when it the right time to change them out for the summer annuals. It’s the same debate we have in the fall. I got my pansies planted so late last fall they never took hold very well. Now that they’re blooming I hate to take them out too soon. What a delightful arrangement. I really love those brownish mauve colors in pansies. Thanks Linda, I’ve enjoyed those unusual colors. Normally I wouldn’t have bought such a wide range of colors but it’s been fun to have them this year. I absolutely adore this arrangement as I am a pansy fanatic….I was hoping to put together an arrangement with cordial glasses too, but now I am not sure what will be blooming by next week…all my flowers are covered with 6-8 inches of heavy snow that is expected to last a few more days and then more frigid temps…I think most will be done for but hope the hellebores will bounce back and maybe some daffs. It will certainly tell me how resilient my flowers really are. Donna, it would be hard for me to enjoy a snow at this point in the season, but we have had some in April before. Our temps aren’t settled yet either, with threat of frost tonight. It is heartening to see flowers bounce back. I imagine your hellebores will be ok.
Beautiful assortment of pansies. I love them in the little glasses on the tray! Thanks Cindy. Those glasses/caddy were a wedding present years ago and I’ve always loved the shape. Pansies deserve more exposure than they generally receive – they’re such lovely flowers. I planted quite a lot of them myself this fall in the hope that the rains brought by El Nino would sustain them, but then El Nino stood up southern California. Still, they’ve held up better than I’d have expected. Your “preview of art in bloom” exhibit sounds very interesting – I hope you thoroughly enjoy all the presentations. Pansies are valuable bridging the gaps when not much else is available. El Nino let you down-it’s a curious phenomenon. Thanks. I’m am psyched about Art In Bloom. I never think of pansies as cut flowers…shows what I know. “Charming” is the word that comes to mind. The stems on pansies are so short they’re really difficult to arrange and I don’t expect them to last long. They’re fun for the short-term. Have a good week Ricki. I adore pansies, such sweet little faces! So do I Eliza! Have a good week. 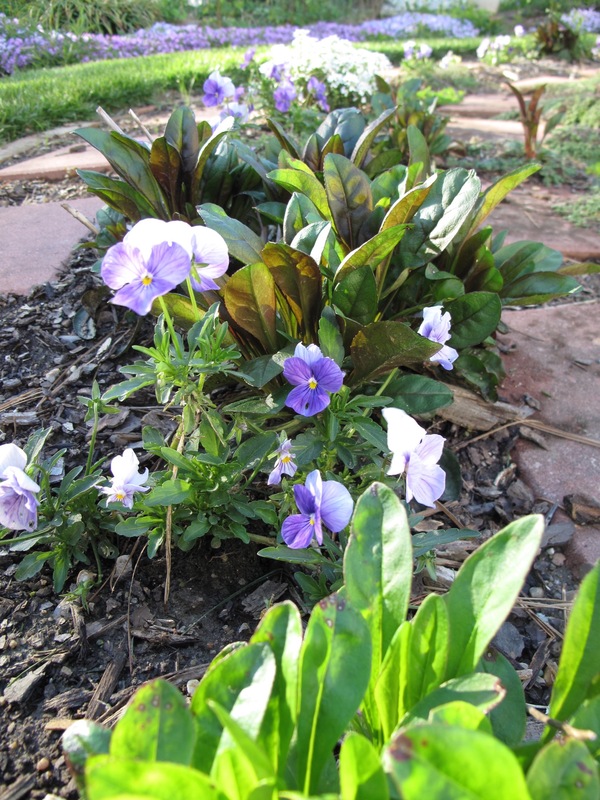 Violas are one of my favourite plants, they along with the pansies look good in the meditation circle. Thanks Brian. Pansies won’t do well here once we get into summer, but they’re a good bargain for providing color from fall through spring. I hadn’t realized they were called Antique Shades but found them (google, of course). Thanks for giving them a name. my all time favorite, except for the crystal bowl series!! true blue is hard to beat. Thanks so much Julie! This was a fun exercise. I am so lucky to have my 3 sisters. I love pansies – almost got some this past weekend. Almost got some? I’m seeing bright plantings of pansies all over town. Hard to beat them for some cheerful color. I like your arrangements! I must admit, I have a thing for small arrangements of the same flower–like your pansies, or lilies of the valley, or daffodils. Very nicely done! Thanks Beth. Small arrangements can add a bit of cheer anywhere. A beautiful still life with gorgeous warm colours – I love them too, dear little things. Thank you Annette. They are sweet flowers. 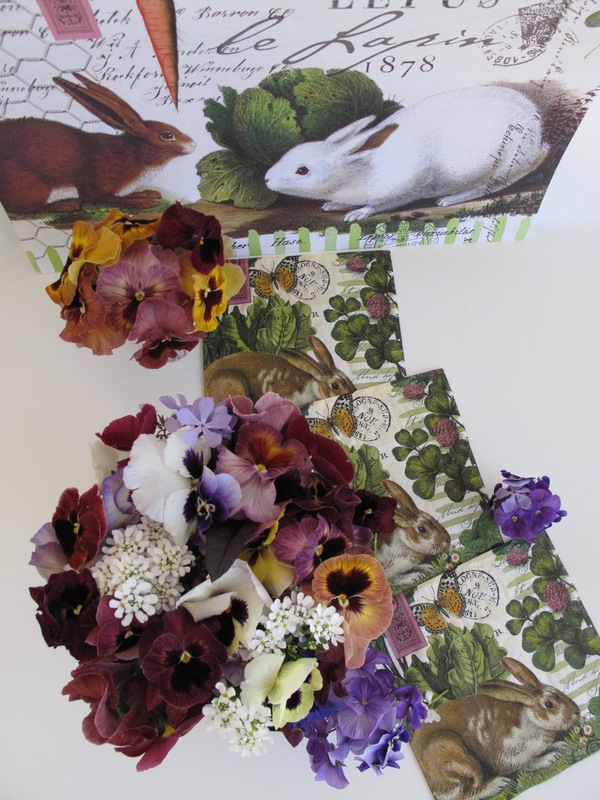 Your rabbit cards give an almost 3D effect to the rabbits, as though they were really there sniffing the sweet pansy faces. My favorite is the deep purple with the white startburst, but all the colors look lovely together, Susie. Thanks Hannah, I ended up with zillions of photos of those rabbits nosing up to the pansies. Was fun to play with the perspective. Oh so pretty! You inspire me to go and get some pansies and violas. 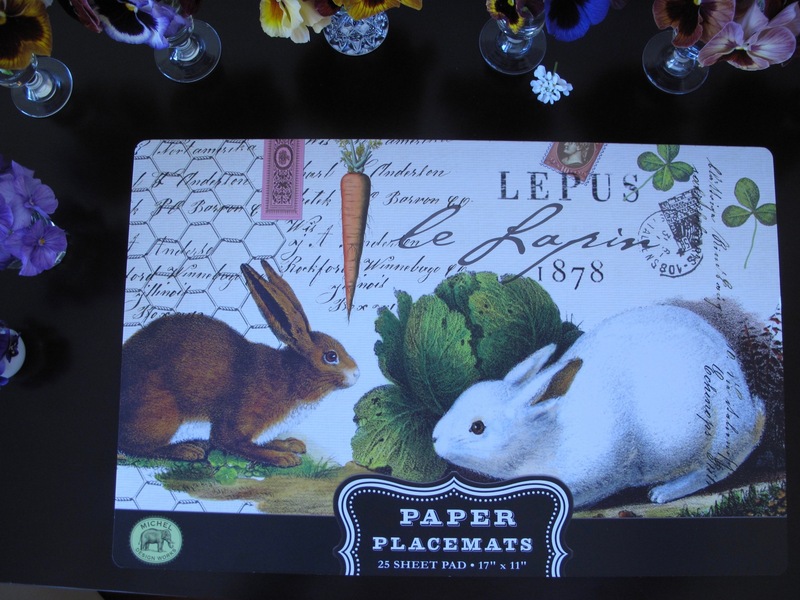 They really make an all over pattern with the lovely placemats, with the clover leafs and even the markings on the rabbit echoing the pansie patterns. Cath, will the pansies overwinter in NZ as they do here? 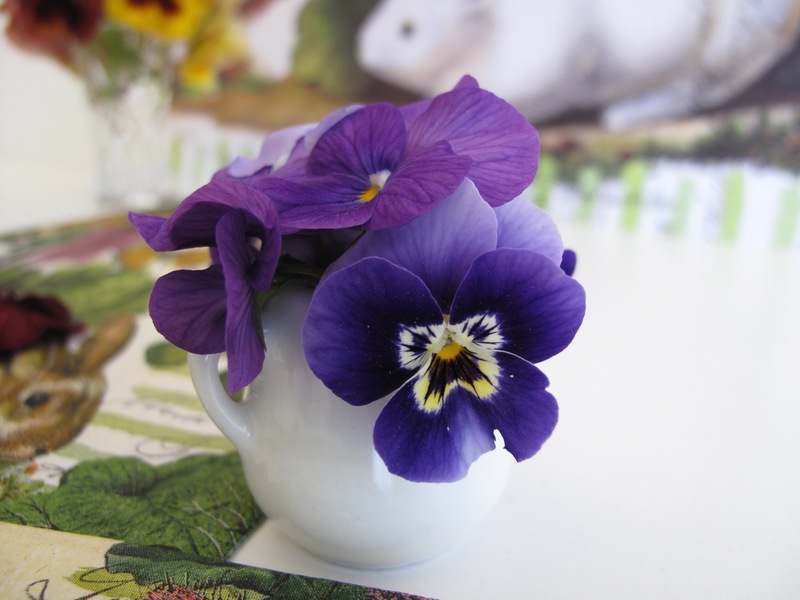 I had so much fun photographing the pansies and playing off those little rabbits. I think they will, I’ve had Violas come up for a few years in a row. That was really a gorgeous series of photos. Love to see this because, like Donna, most of what I had blooming is now under 6 inches of heavy wet snow! So much for “spring!” And a late season cold kept me from cutting what I should have before all the stuff fell from the sky. Oh well–there’s always next year. Snow has dampened Spring for a lot of folks. So disappointing to lose those precious blooms, but I hope you’ll have many resilient ones. A lovely way to display pansies Susie! Glad tobhear you don’t have real rabbits in your garden. I can only grow my pansies in pots, as they are rather attractive to slugs and snails. In your meditation circle they really look good, and I love those shades too. Thanks Cathy. Actually I usually have a family of rabbits every year but they don’t bother the pansies that I recall. Maybe I’ve pulled the pansies out by the time they homestead. Not sure what they eat, some clover from the grass. 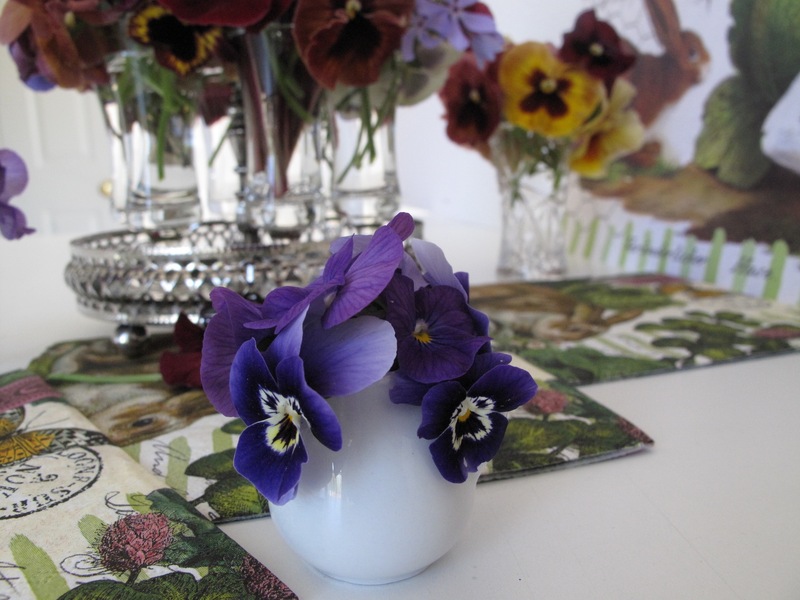 I love it, pansies are absolutely irresistible with their dear little faces. I love the imaginative way you have displayed them. 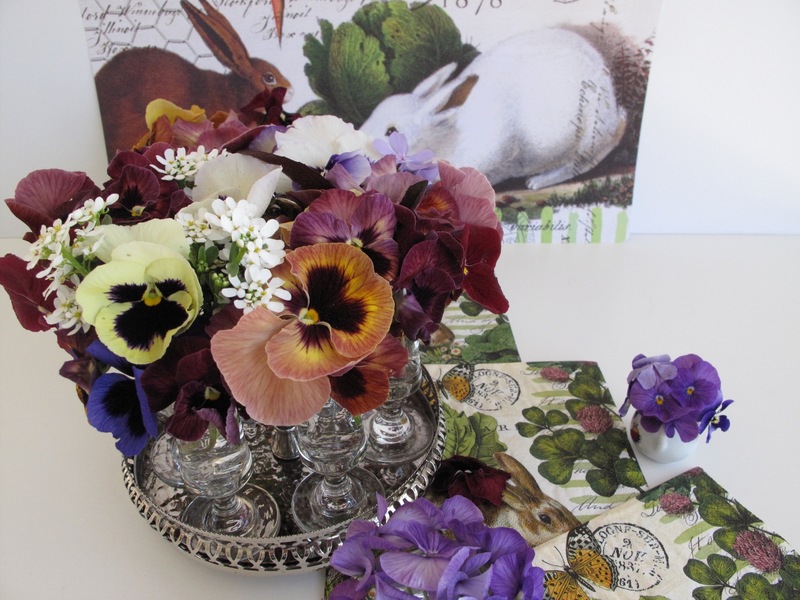 Pansies were fun to play around with this week–with inspiration from the little rabbits. 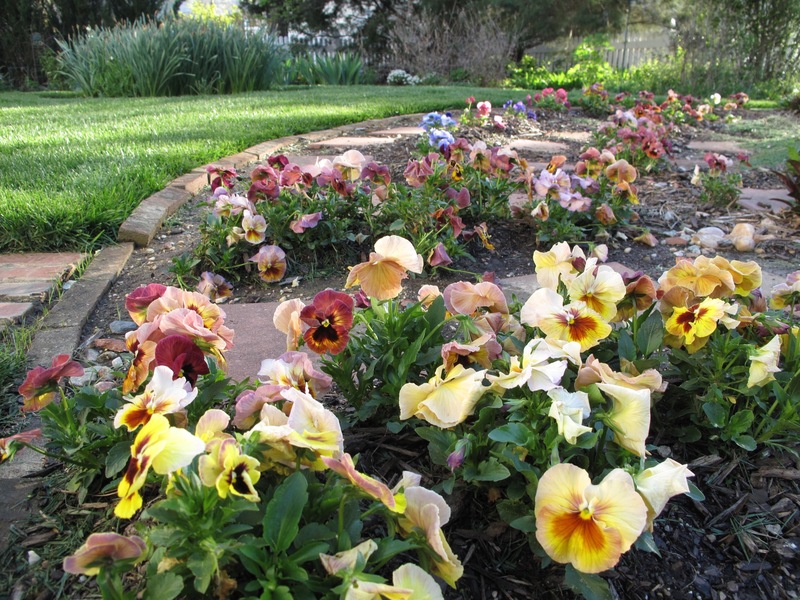 The pansies have really filled in well, and I love the colors you planted. Thank you, yes such a playful photo shoot this week. Usually I prefer more minimalist designs but it is fun to change things up sometimes. I really love pansies. They look so fragile; never thought that they will do well in a vase. But, your arrangements are really lovely. 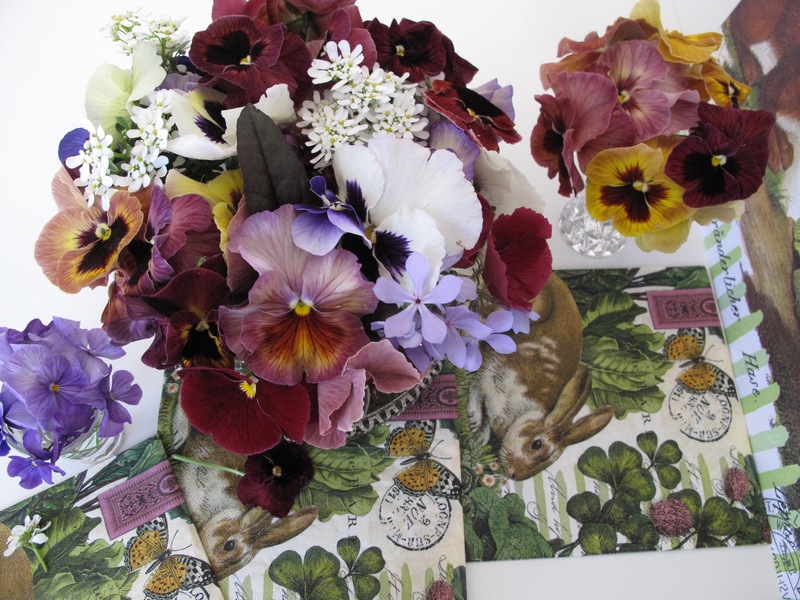 The pansies lasted a few days and dried so lovely it reminded me I should gather some and press between pages of a book.